ed. C. Zervos, Cahiers d'art, 3e anne, 1928, p. 452 (illustrated). V.E. Barnett, Kandinsky Watercolours: Catalogue Raisonn, Ithaca, New York, 1994, vol. 2 (1922-1944), p. 236, no. 905 (illustrated). 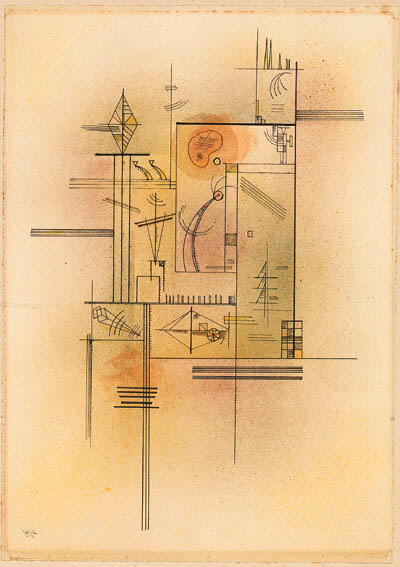 Paris, Galerie Zak, Exposition d'aquarelles de Wassily Kandinsky, January 1929, no. 55. Christian Zervos, the first owner of this watercolor, is best known today as the editor of the catalogue of Picasso's works. He was also editor of the periodical Cahiers d'Art and published a monograph on Kandinsky by Will Grohmann in 1930. He bought Etwas Violett at the above-mentioned Kandinsky watercolor exhibition at Galerie Zak, Paris in 1929, and also received Mitte-violett (Barnett, no. 919) as a gift from the artist.